Earlier this summer, I attended a dinner in which the other lively and funny guests turned cynical near the end of the evening when they encouraged me to tell them more about my work. When I explained that I’d be teaching a graduate education course in a few days, the woman who only a few minutes earlier had been bragging about her son’s work in Europe following graduation from the same very selective college that she’d attended, cut me off when I began talking about working in this course with teachers. “How many of them are good?”, she asked flippantly. I’d listened trough the evening as she had talked about her second home, as she’d name- dropped, as she rattled her expensive bracelets and flipped her excellent hair. But she was funny, an excellent story teller, and generally so well-mannered and lovely. Until we started talking about teachers. Because our hosts were good friends, I held my tongue. As far as I know, she had had no contact with public schools since her children had graduated years before. Yet she felt completely entitled to insult the graduate students in my program, and to patronize me. Corey Robin calls this sort of classism for what is is in the essay he published this week about the Chicago teacher strike (that was also reposted — and thus generated a different set of comments — on The Answer Sheet). Teachers had opted out of the capitalist game; they weren’t in this world for money. There could be only one reason for that: they were losers. They were dimwitted, unambitious, complacent, unimaginative, and risk-averse. They were middle class. Meanwhile, as several commenters on the post point out, the Koch brothers and their allies are successfully convincing the working class that teachers are privileged elites who are in it mainly for the benefits. As I type this, I’m listening to a high level journalist talking on the radio about the “special interest” teacher union that is disinterested in reform, all without addressing a single issue that was contested in the strike. Rahm Emanuel was sure to get his fit upper-middle class body photographed next to smiling children of color this week in his suit and starched white shirt. He smiled serenely back at them. 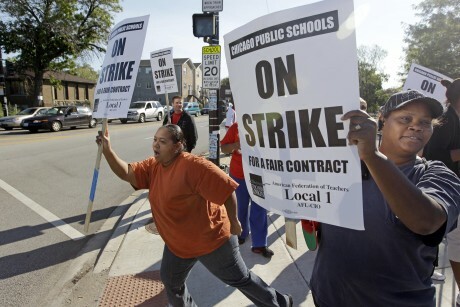 The striking teachers were consistently photographed in t-shirts and baseball caps, shouting and shaking their fists. Robin called this classism for what it is. Let’s be sure that he’s not the only one.